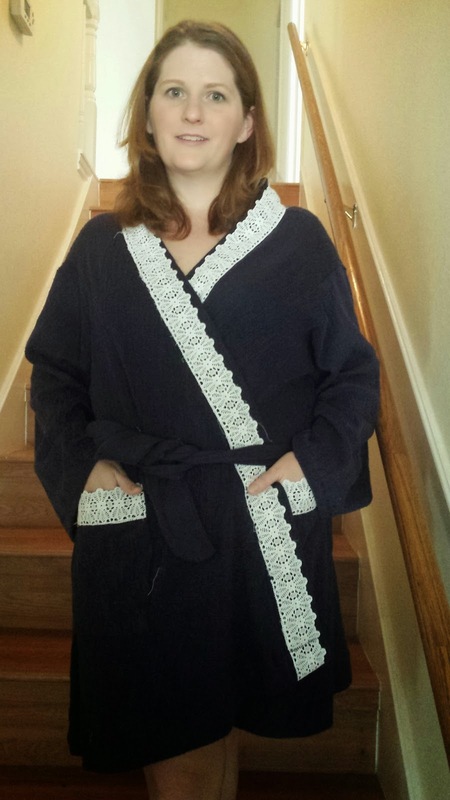 I had this robe completely finished before Christmas, but in hindsight my machine was in its final days and could not hem it. Good thing it is still unseasonably cold here and I can still enjoy this sweatshirt knit robe. 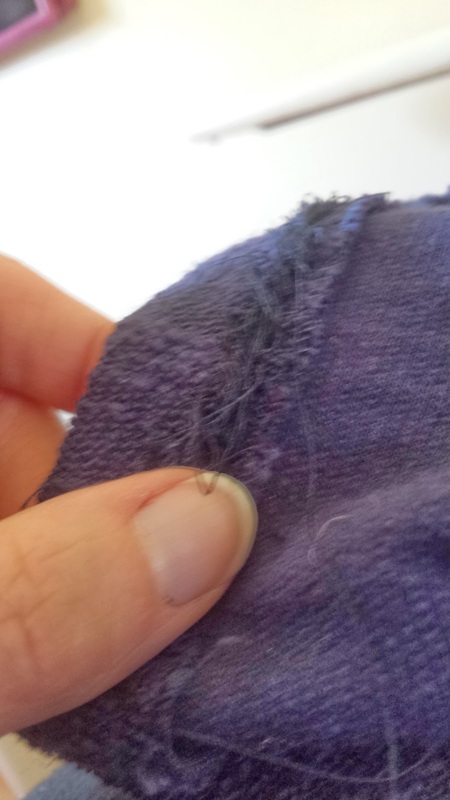 This is what my machine was doing to the hem. It was tragic. I got some great advice from you guys, but the machine could not be salvaged. 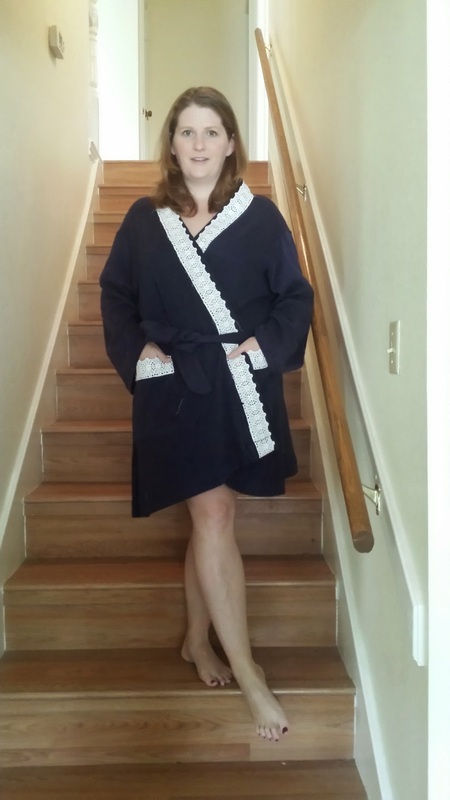 Back to the robe, I used Simplicity 1720. The sweatshirt knit I got was bought with a robe in mind as I wanted something warm I could dash around the house in while we had Mr. Thinks He Can's family staying with us for Christmas. I dashed around inappropriately instead which was much more exciting, so it worked out OK. I am glad to have a robe though. 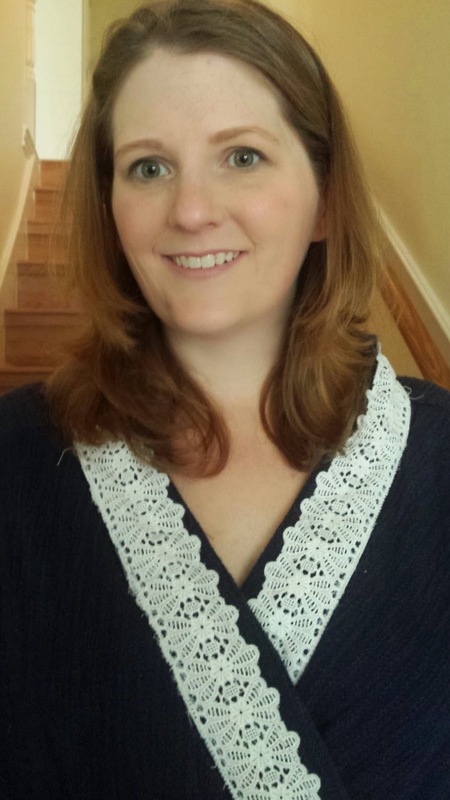 Man, I got the crazy eyes! This lace was from an estate sale and as I began sewing it I realized it had been salvaged from another project at some point. You can see a couple strings hanging off of it where old fabric was still attached. I like the character it adds to the project. I also made a couple of simple rectangle pockets to stick on the front. What's a robe without pockets? 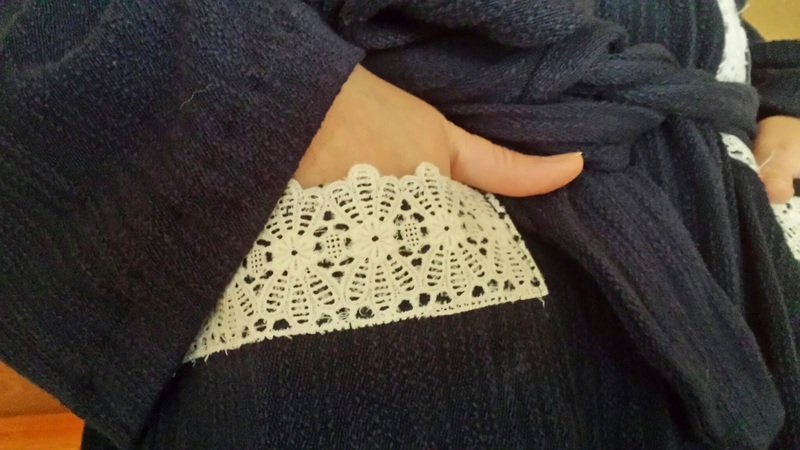 I used the same lace across of both pockets. 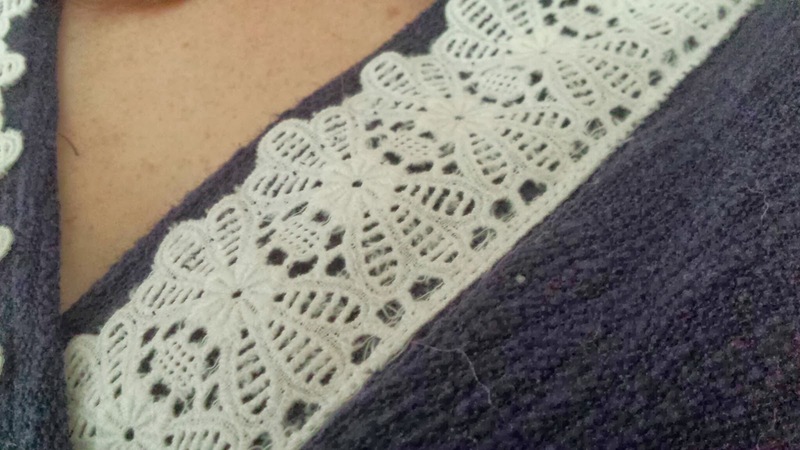 Here is another close up of the lace. I think it is very pretty and makes the robe a little more glamorous. An update on the sewing machine situation. I went with the Brother PC420 PRW after Judi gave such a glowing review of it. I have used the heck out of it so far and all I can say is wow. 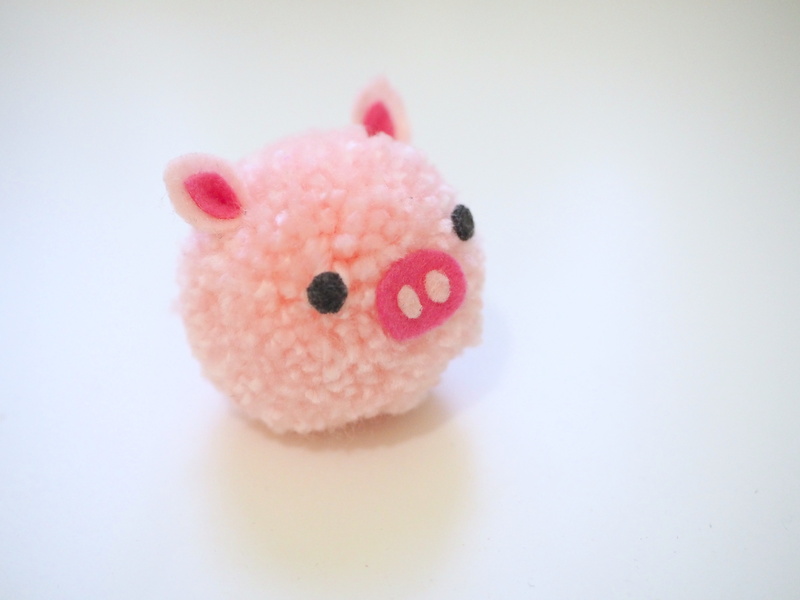 It is so quiet, and why didn't you guys tell me about how much technology can help in sewing? I am amazed. I love my automatic thread cutter button. Also, I didn't think I would ever use the automatic threader, but I'll be darned it actually works! Ooh, one more thing it has a lever that hangs out the bottom so you can lift our presser foot with your knee. I didn't know I needed that until I got used to it. Also, as I was hemming my robe when I would get to seams it went right over them with no fighting. I didn't realize I used to have to fight but as I got near them I would tense up and white knuckle the robe and get ready to yank. I didn't even know I did that. Anyway, I want to play on my machine a bit more before I give a full review, but I am very happy with it and thank you guys for talking me into it! Yay Stacie!!! I sooo glad you have your new machine!!! I was hoping you would get that one...I knew you would like it. This is rather embarrassing because I did read the entire book before I used mine, but somehow I missed the part about using the knee lever to lift the presser foot. I thought it was an optional to use instead of the foot control. (or the start/stop buttons) LOL!!! Today I'll connect my knee control. THANK YOU!! !